It was only a couple weeks ago that the news came out that Floyd Mayweather was looking to liquidate part of his famous car collection. Now, another car that used to be owned by the conspicuous consumer and boxer has shown up on the open market – this one on eBay! 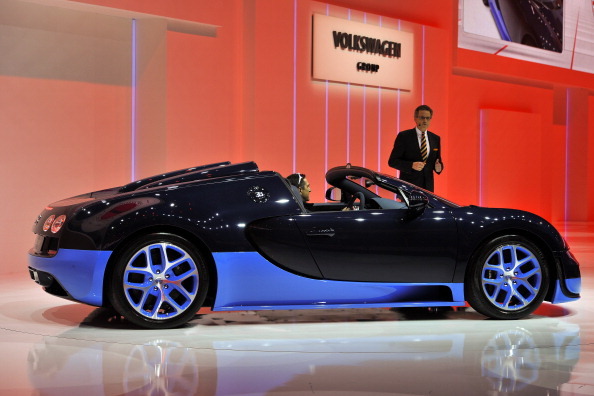 "Current on all services, this Bugatti is powered by a W16 8.0-liter quad-turbocharged engine producing up to 1,200hp. It has a top speed is 254 mph, with a 0 to 60 time of 2.4 seconds. With only 150 Grand Sports built worldwide, and these car was one of the last Garnd Sports [sic] brought to the US." The car is satin black with a leather interior of black and orange, and the description also specifies that the car has only one previous owner, the "undefeated boxing champion Floyd Mayweather Jr." Like a cherry on top, the car "comes with two keys, plus the speed key, battery charger, car cover and presentation booklet." Mayweather paid almost $3.5 million for the car when he purchased it back in 2015.